Ms. Cooper started her employment with the County of Ionia in February, 2006 when she was hired as a Deputy County Clerk. In October, 2008 she was appointed as the Chief Deputy County Clerk, the position she held until she was elected as County Clerk in November, 2016. Cooper took office on January 1, 2017.
Cooper graduated from Carson City-Crystal Area High School in l989 and then attended Montcalm Community College focusing her attention on Paralegal and Business Administration studies. Additionally, she possesses 13 years of banking experience primarily in the mortgage area and was voted Employee of the Month two times throughout her banking career at Independent Bank Corporation. She has two children, Kali and Tyler and two granddaughters, Ava and Eve. She has been resident of Ionia County for 25 years, currently living in the beautiful City of Portland with her two dachshunds. Cooper is an Accredited Election Official with the Michigan Department of State Bureau of Elections and is a Certified Election Inspector and Trainer. 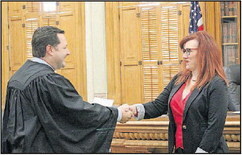 She is a member of the Michigan Association of County Clerks and has served as the Vice-Chair and Secretary to the Ionia County Republican Party. Cooper also has served on the Ionia County Commission on Aging Board. Cooper has programmed all elections held in Ionia County since 2009. Programming elections “in-house” is a tremendous savings to tax-payers, as there is no need for the work to be contracted out. She will continue to perform this service to the citizens of Ionia County in her capacity as County Clerk. Since taking office in 2017 Cooper has progressed the County forward by putting into action a more secure and accurate voting system which is also ADA compliant.